Swift machined components out of stainless steel with a 32 Ra surface finish requirement. At Swift Manufacturing & Engineering we are a Wisconsin contract manufacturer specializing in CNC machining using conversational and offline programming as needed. With our CAM software package we are able to program using 3D data right within SolidWorks to program complex 3 and 4 axis simultaneous machine movements. Soon to implement 5 axis. We can import any 3D data and generate tool paths from your solid. That being said, we can still operate with a print alone or 2D data. Our Madison Wisconsin based machine shop capabilities are in Vertical Multi-Axis Milling and Multi-Axis Turning. As well as support equipment for in-process and secondary operations. Swift has strong relationships in manufacturing for secondary operations, injection and blow molding, coatings, plating, welding, fabrication, and more. We offer a cost savings by handling the secondary operations for you, and provide all necessary certifications. The flow of secondaries can be difficult to manage and, with our customer portal, you can log in and check on the status of job at any given stage. 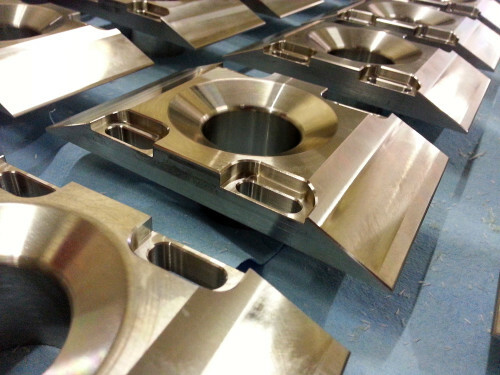 We specialize in hard to manufacture components with many secondary operations on a production basis. No job is too small nor to large. We have a complete understanding of new product development and small, medium and large scale manufacturing. With engineers on staff, we ask the right questions to get the job done right. Swift Manufacturing & Engineering is also approved by the State of Wisconsin Department of Workforce Development for our Apprenticeship program. We have apprentices on staff and are committed socially to giving back through training in the skilled trades. Alternatively, you can also upload your files using our DropBox cloud storage. Please contact us for more information.